Minnesota Public Safety Commissioner Rich Stanek resigned under pressure in response to an admission 12 years ago that he used racial slurs during his work as a police officer. An African American state lawmaker and several African American community leaders raised questions about the racial epithets Stanek admitted making during a court deposition in 1992. The renewed attention to the deposition came on the eve of Stanek's scheduled confirmation hearing in the Minnesota Senate. St. Paul, Minn. — Stanek's admitted making racial slurs in a deposition in a police brutality case brought against him for an incident in 1989. It was one of three police brutality lawsuits brought against him while serving with the Minneapolis Police Department. Pawlenty says he didn't know about Stanek's racial slurs until a few weeks ago. He says he questioned Stanek about the incident this week and decided on Friday that it was best for Stanek to resign. "The reason we're taking the action today in mutual agreement with Rich is that the person who holds this position has to have the public's trust and confidence, even if there are questions -- legitimate questions -- regarding someone's views regarding race relations or racial insensitivities that impedes that person's ability to be effective in this job," Pawlenty said. Pawlenty says his gubernatorial transition team did a routine background check on Stanek. He says they did a criminal background check, interviewed present and former employers and interviewed him. Pawlenty says he knew little about the comments even though the admission was included in several newspaper reports in 1995. 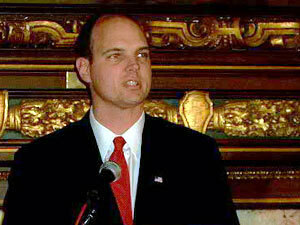 Stanek was not available for comment but released a statement saying he was thankful for opportunity to serve Pawlenty. He said he didn't want the controversy to distract the department. Stanek also said in the statement that he used the racial epithet when required to repeat the statements of others. In the deposition, however, he admitted to using racial slurs to express his own thoughts. Stanek says he never used a racial slur in a hateful or angry way toward anyone during work or home. "Of course he's upset, " said Public Safety spokesman Kevin Smith. "This has been his whole life and this was been the pinnacle of that and now it's no more. So put yourself in that situation." Pawlenty and several others say Stanek has repeatedly apologized over using the slurs a decade ago. But DFL Rep. Keith Ellison of Minneapolis questions the timing of the apology. Ellison called a news conference on Friday morning to call for Stanek's resignation. He suggests Stanek was apologizing to save his job. He says Stanek has continued to promote controversial legislation that harms the community. Ellison noted as a legislator Stanek objected to the collection of data on racial profiling by police. "I do believe in racial reconciliation, but you know what? When somebody makes an apology on the eve of them being confirmed for a job that they want, I sort of doubt the sincerity of that apology," he said. Sen. Jane Ranum, DFL-Minneapolis, says she was surprised to hear of Stanek's resignation. Ranum and Stanek butted heads on several issues when Stanek was the chair of the House Judiciary Committee. Ranum says she did not know that Stanek used inappropriate language until a few weeks ago. But she says that it has been widely known that Stanek has been sued for police brutality. Ranum, who sits on the Senate Public Safety Committee, says she didn't know if he would have survived the confirmation hearings if he stayed on. "While his statement in '92 is regrettable, the most important question (is): was this isolated or was it a pattern? I can only assume that commissioner Stanek has decided that it's best for him to resign and the administration believes it was good for him to resign and I think that's a good thing to do," she said. Ranum and others say Gov. Pawlenty should speak with the members of Minnesota's minority communities about who would be the best candidate to replace Stanek. Pawlenty says Mike Campion, the superintendent of the Bureau of Criminal Apprehension, will replace Stanek on an interim basis. Pawlenty says the search for Stanek's replacement will begin immediately.